A few reports from the TTC contain a lot of information, but I expect only the dedicated will actually read them. There are also the even more detailed “Blue Books”, two large binders with over 1,100 pages of project descriptions. These are not available online, but I have read through them to get a very fine-grained sense of the work the TTC proposes in its Capital Budget. For the purpose of calculating the costs that apply to the subway, I have combed through the budget and broken it down into component parts by mode. All figures are in millions of dollars. Note that some of my numbers differ slightly from the TTC’s mainly due to rounding. The values here are from the November 2017 version of the budget. Since then, some changes, notably the availability of more money from the Federal Government through the PTIF program, has shifted things a bit, but the main effect is to bring projects into “funded” status. The Base Funded Budget is the amount the City is prepared to give the TTC either from its own funds or from subsidies received from other levels of government. The Unfunded Base Budget contains projects that are approved to be in the Base, but for which no money is available. The streetcar system is at a level that is above historical levels because the costs associated with the new fleet and with related system upgrades are still being digested. Seen over a longer period, streetcar costs are a lower proportion of the total. The subway consumes about half of the funded budget and almost three quarters of the unfunded Base Budget project list. But this is only the start. There are other categories of “unfunded” projects that are not included here because Council has not approved putting them into the Base Budget. Not in Base Budget: These are items that TTC management has flagged as being required, but they have not been approved by Council for inclusion in the Base. Unfunded Scope Changes: Projects within the approved Base have changed in scope, but funding to cover these changes has not been approved. Future Consideration: These are “nice to have” items TTC management feels will come into play in the future. The largest among these is the major reconstruction of Bloor-Yonge Station to increase capacity and the provision of Platform Edge Doors on Line 1 YUS. PEDs for Line 2 Bloor are beyond the scope of the ten-year plan. For the Base Budget, the subway represents about $5 billion over ten years. This includes almost nothing for new lines (only a few small studies) and this cost is overwhelmingly just “to keep the lights on”. Note that this is separate from costs charged to the operating budget of day-to-day maintenance, costs that would remain with the City under an uploading scenario. The list of additional items is missing one key piece: the construction of a new subway yard and carhouse at Kipling. The budget includes funding to buy the property (acquisition is already in progress), but not to build anything on it. This yard is essential to the fleet replacement on Line 2 which, in turn, is a pre-requisite to the opening of the Scarborough Subway with ATC signalling. Of the provincial gas tax allocation to Toronto, the City allocates about $70 million to capital projects. Taking the Base as being about 50% subway, then $35m of the provincial money might be held back. Similarly, the federal government gives Toronto about $160 million in gas tax annually, of which $80m could be viewed as “subway” dollars. Whether the Feds would look kindly on Queen’s Park scooping a “municipal” transit subsidy remains to be seen. Between them, these two subsidies would reduce the annual upload to around $385 million, rather more than the $160 million the Tories cite. Moreover, the provincial component does not vanish, only the need to send money to the City as a capital subsidy. Ontario would still be on the hook for about $420 million per year. PTIF is not much help here because the Phase 1 PTIF money is largely going to the bus fleet’s rejuvenation, and a lot of Phase 2 will probably go to the big construction projects, not capital maintenance. Oliver Moore describes the way that the subway was financed. Toronto’s subway has been built over decades, with the city financing the original and still most-heavily used section. As later parts were added, the province and Ottawa gradually took on major funding roles. The understanding was always that Toronto would own the resulting infrastructure. This underpinned a deal struck when the subway expanded outside city boundaries last year: Toronto residents subsidize the cost for passengers boarding in York Region and, in return, Toronto owns the new subway tunnel. In current dollars, the subway network cost about $8.5-billion to build. Because construction has become more expensive over the decades, the theoretical replacement cost – using the price per kilometre of the most recent expansion – would be about $26.5-billion. The Tories view it differently, suggesting that much of the network’s value has amortized out to zero by now. And to discuss its current value is relevant only if someone is willing to pay that price, they argue. Mr. Phillips [Rod Phillips, PC candidate for Ajax] said there is no plan to pay the city for its subway, but noted that taking over the capital maintenance is a sort of compensation. Ownership of air rights over current stations would be a matter for negotiation with the city, while the province would retain such rights over new stations. 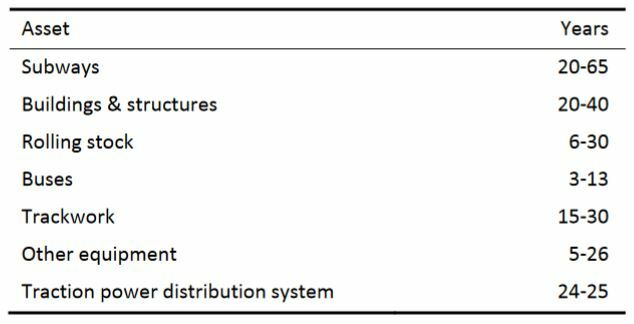 The depreciation rates used by the TTC are shown in the table below taken from the draft annual report for 2017 recently presented at the TTC’s Audit & Risk Management Committee. The original 1954 subway will be fully depreciated in 2019, but more recent lines have years to go before they are fully off of the books. More importantly, many parts of the subway have been replaced largely at the City’s expense over the years, and they are still very much “on the books” together with the ongoing interest cost for debt the City floated to pay for this investment. Other issues would also have to be negotiated. Among them is the question of whether the TTC or private contractors do the capital maintenance work. And there are likely also to be continuing discussions about which work needs to be done and how urgent it is. By its nature, capital maintenance can often be deferred in the short term, although transit agencies that do this too aggressively often pay huge costs down the road. In New York, a recently unveiled plan for long overdue maintenance and upgrades had a 10-year price tag estimated at US$37-billion. If the government attempts to shoehorn the capital maintenance budget into its presumed value of the upload, many projects will simply fall off of the table. In the short term, this will not hurt much, and that was the situation nearly three decades ago as the TTC grappled with declining funding during the 1990s recession. That had a tragic cost, however, with the 1995 Russell Hill disaster where the investigation revealed the effects of deferred maintenance. Politicians of all stripes are happy to announce funding for new projects, and the Tories certainly have their list, but without regular maintenance, slow deterioration will reduce the subway’s value as a transit asset. Recent debates over transit expansion at city hall have been highly politicized, featuring bad-faith arguments and producing results at odds with expert analysis. But the process at least happened in public, was monitored by the media and played out over many hours of open debate. Provincial decisions have been more opaque. Some key meetings of Metrolinx, the regional transit agency, were not public – government officials interfered in the process and the agency has been accused of modifying evidence to suit its political masters. Ultimate power rests in the Premier’s Office or at the cabinet table, where decisions are reached behind closed doors. If there is one part of the provincial transit machinery desperately in need of housecleaning and transparency, it is Metrolinx and its use to shield provincial policy development from public view. The level of detail including a ten-year view of future plans that is available in budgets for City agencies such as the TTC simply does not exist at the Queen’s Park in any public document. Projects are announced as and when the government and publicity hungry ministers want a photo op, and cuts are rarely announced with explicit details at all. If financial plans dictate cutbacks in subway spending, you can be sure that Metrolinx will be the last to tell us, and will concoct all manner of explanations and “business case analyses” to justify whatever the government wants to do. Changing this political culture is a big challenge for any government, although some parties might prefer to retain and expand on the level of secrecy to avoid being held to account. The numbers in the tables above are taken from my condensation of the TTC’s detailed budget. The dollar figures are the TTC’s. The allocation of them to specific modes is my own. Page 1 of this breakdown is organized in the same major categories as the detailed budget, but with each line allocated to the four modes. Some items are easily assigned to one mode because they are things like station elevators that serve only the subway. Others are general costs which I have allocated across modes typically on the basis of 50% subway, 35% bus and 15% streetcar. One may quibble with this formula, but the dollar amounts distributed in this way are small and tweaking the percentages will not change the overall result much. Page 2 includes the line by line detail of the Buildings & Structures budget because this is a large portion of the total ($1.6 billion), and each line affects different modes. The project titles are taken from the detailed version of the budget edited in some cases for space. Costs to the end of 2016 (if any). Probable costs for 2017. At the point this document was created, the accounts were still open for 2017. Annual spending projected for 2018 to 2027. For ongoing projects such as track replacement, 2027 is a net new cost as it did not exist in the 2017-26 budget. Ten-year totals for the previous and current budget windows. This entry was posted in A Grand Plan, Elections, Finance, Subways. Bookmark the permalink. Many thanks for this, yes, Steve. I know the facts won’t matter to some, like Mr. Ford and his ilk, but let’s hope that his ‘scheme’ (good choice of word), and mathemagics get so much suspicion that all people worried about good economics, environment, transit/mobility etc. will avoid voting for him, just as the Globe has refused to endorse him. And let us not forget the role of the Conservatives in filling in Eglinton and giving us the costly Sheppard stubway, and more recently, the larger mess of trans*it in Scarborough, which sadly, all three major parties seem to be content to accept, thus denigrating further the concept of being responsible and responsive to facts and logic. That is, the numbers and benefits of the Suspect Subway Extension are horrible, and options have been ignored, and cui bono? But Mr. Ford etc. are wily – and by creating the possibility of chaos, atop of the major stress and smell of existing scheming – we are ignoring the costs of automobility, which is many billions worth of subsidy and avoided cost. Carservatives, likely in all parties as votorists are, will be happy to not go there, despite as one example, the high costs of health impacts both direct and indirect of this Ontcario car Kultur. I’m glad that there was some Ford mention of having a fully-paid off asset however, making it easier to scoop it up. So many of our rental housing buildings are fully paid off; and should be taken away from their owners, correct? Hey listen! A subway from Kenora to Cornwall! What would be wrong with that? All paid for by the high fares of course, not by drivers of Ford Escalades. Steve: I wonder if Ford knows that if he becomes Premier, the OPP will not let him drive his own car? Subways are expensive. Probably the worst outcome would be for whoever wins the election to upload the subway system right away and then discover that from first hand experience early on, and then start deferring maintenance to try and keep costs down. We all know the problems that deferring maintenance creates in the years ahead. As for the Globe and Mail, at least they aren’t repeating the tack they took a few years ago and encouraging people to “vote conservative, but not for for Ford” the way they endorsed the conservatives but not Harper in the last federal election. I’m not sure who the Globe and Mail is endorsing, if anyone, this time around. It’s true: the OPP chauffeurs the premier around. I’ve seen it firsthand. A couple of years ago, I was working in Windsor and Kathleen Wynne was scheduled to appear at work for an hour and they wanted some equipment that hadn’t been commissioned yet up and running for the visit so I took care of that and once I had everything tested out to my satisfaction, I went outside to take a break and when I got back from the local Tim Hortons, as I was cutting across the parking lot from the dead end street at the back, Kathleen’s motorcade of a couple of OPP vehicles rolled in and she stepped out of a giant Chevy Tahoe. So much for riding around in a smaller, more environmentally friendly vehicle. I will let others debate whether our politicians should be riding around in the front or in the back of police cars. Oh, please. I know what they have planned. They take control of the subway and we never get a DRL or anything else we actually need for residents of the city. We get all kinds of ridiculous suburban extensions into the 905 that we 416ers pay the bill for. Square One to Yonge and Bloor for a token. Suburbanites wanted the city to pay for their transport, just like the DVP and Gardiner. I’m with you ‘south’ Toronto people in that I feel as though I’m hanging on a cliff, waiting for one of those yahoos to become premier. She would seem to be much more innocent than he; but that very innocence terrifies me. From a 905 perspective, I don’t think that either of them should be blamed for the ‘gaps’ in our ‘rapid’ transit system. There has been a perverse desire to fill in almost every open field within 100 kilometers of the lake and Yonge Street, since the Simcoes came to town. No level of government has ever questioned this dopey philosophy for very long. Dalton did try, and Kathleen, by extension, went along. In my lifetime, I’ve watched, in frustration, as some beautiful areas [eg. Lawrence between Don Mills and Victoria Park] went under the concrete. Now the same process is taking place in formerly pretty towns like Sharon. I’m not opposed to immigration at all; I just would have appreciated more effort put into a southern Ontario-wide plan, since 1793. So, if Doug ‘happens’ to win, he will be expected to do the now impossible; and subways cubed will appear to him to be the only route to happiness for those who don’t enjoy viewing the present wonders of Lawrence and the DVP from the comfort of their parked cars. Taking into account the results of the election now, is there any way the provincial government could force the City to go through with this? I mean, if the City of Toronto doesn’t want to “upload” the subway to the Province, there’s nothing the Province can do about that…right? I don’t think that the PCPO understands the degree to which capital and operating maintenance are intertwined or their combined cost. Construction of and responsibility for new lines is fairly straightforward by comparison. There is also the small question of the considerable debt the City is carrying to pay for its capital investment in subway construction and maintenance over the years. Well, there is a certain irony to extending the subway outside of the 416 area code to carry regional commuters to the detriment of TTC passengers originating within the city of Toronto at the same time the regional commuter system is being highjacked to provide local service within Toronto to the detriment of commuters originating within the 905 area code. To my mind the ideal outcome would be to stop building the wrong things in the wrong places but I’m not optimistic about that happening. The back story, however, is quite interesting, and relevant to TTC Staff’s present inertia in responding to stagnant Metropass sates and TTC rides 2014-2017, before dipping into decline in 2018. They simply put, do/did NOT have the education, training or experience to recognize the declines in advance, and competently implement impactful marketing plans to reverse them. MDP was originally introduced as the MSP: Metropass Savings Plan—a panic crash launch, literally, over a weekend, in June, 1996, after the 2nd TTC fare increase in 9 months, and, loss of ~90M rides since 1988 peak of 463.5M rides. Over this time TTC’s average fare increased +70%, while service total km. declined -11%. MSP succeeded in arresting the 8-year ride decline with growth to ~11,000 monthly subscriptions by Dec, 1996 (each with ~68 trips/month—from TTC monthly diary panels). There were no plans to advertise it post-launch, with my M&PA Staff thinking the “Once it was introduced, everyone knew about it.” I responded that for decades the GTA population had grown by ~100K residents/yr, who knew nothing about TTC or MSP, and, decided to refocus TTC marketing away from attractions you could visit on the TTC, to, promoting the benefits of MSP: value (one month free), free parking at TTC lots, convenience (no monthly line-ups, with free home mail delivery in advance of each new month). TTC Market Research, however, showed that Torontonians were unclear what it was, thought it was some kind of bank saving plan, hence its rebranding and relaunch in late Sept, 1997 as the MDP, which succeeded in more than doubling sales to ~25,000/month by June, 1998. It continued to grow to ~33,000/month by 1999, fueling TTC ride growth—despite the Mike Harris government ending its 50% Operating Deficit subsidy to the TTC. Then and now, a high-level RGS: ridership growth strategy is NOT a detailed monthly annual marketing plan. We’re now almost halfway through CY 2018, and TTC rides continue a ~3% YTD 2018 decline vs YAG. Marketing matters (intimate knowledge of the product, fares, riders, segmentation, heavy users, competition; understanding that BOTH fares and service—quantity and quality are important to rides & passenger revenue sustainability; especially wrt network design & connectivity, as Steve has written about, in analyzing individual routes since 2007.